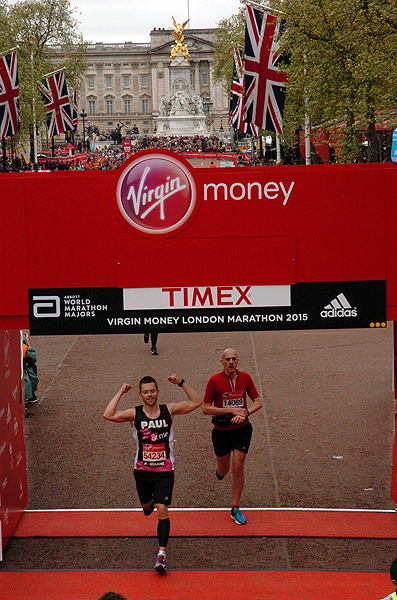 This year will be my 9th London Marathon and no matter how many other races I run, it never loses its magic. 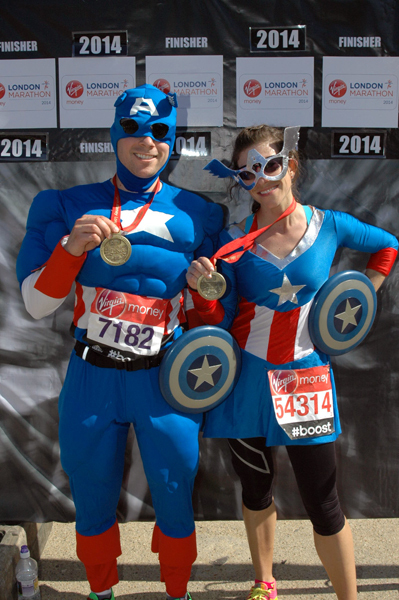 As one of the six World Marathon Majors and arguably one of the greatest marathons in the World, it holds something for everyone. 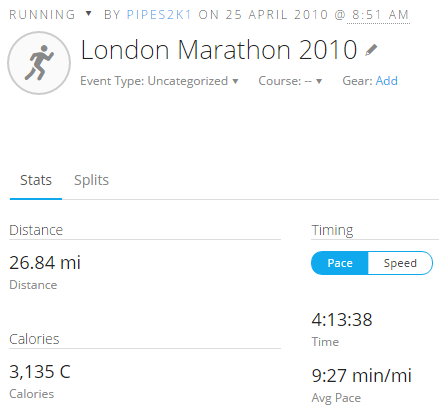 There are a lot of good articles out there with general tips on running a marathon, covering training, mental preparation, etc, but here are my Top 10 Tips specific to the London Marathon event itself which I’ve discovered over the years. Although this applies to many marathons it is especially true for London. You don’t want to start your race off stressed and things will take longer on race morning. If you’re coming in to one of London’s main stations, such as Waterloo, even though you might be on the platform for your connection to Blackheath/Greenwich/Maze Hill (and make sure you know which of those 3 stations you should go to), you may have to wait for 1 or 2 trains to arrive and leave before there’s space for you to get on one. Once you begin the walk up to the starting pens you might stop for pictures with the official photographers and once inside the pens you’ll need time to stow your kit bag and line up for the toilets, at least twice. Depending on your love for social media, also add on the time you know you need for multiple selfies, checking in on Facebook, sending out a #oneinamillion tweet, experimenting with filters for your Instagram post, sending out a Snapchat snap, deciding whether you should get into Google+ and reminiscing on why you were forced to be friends with Tom on MySpace. 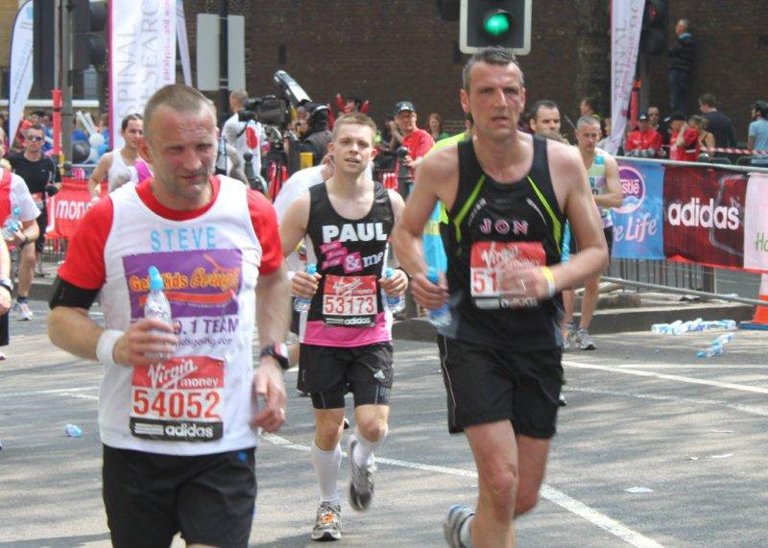 Having your name or nickname on your vest for London is a great idea if you like crowd support. People will shout out encouragement to you personally which can give you a real boost particularly later on in the race. If you feel like you just want to hide for a while then you can move to the middle of the road and when you’re ready for some more cheering gradually work your way back out to one side. There’s also the possibility that at some point in the race you’ll forget who you are and why you’re doing this. Looking down at your vest will yield the answer to one of those questions. If you’re wearing a charity vest then you’ll know both. The gun goes off, you shuffle towards the start line, the adrenaline kicks in and when you finally begin you suddenly feel like Road Runner escaping Wile Coyote. The only trouble is everyone else is holding you up and going too slow. I’ve made this mistake, you zig around some people, then zag around the next lot, then you’re on the wrong side of the road for the corner and your pacing is everywhere. All the zig zagging adds extra distance onto your run; I’ve finished with a total of 26.84 miles on my GPS watch before. Over half a mile of extra running is typically going to add 4 – 5 minutes to your finishing time, depending on your pace, and even if you aren’t going for a time it’s still half a mile extra to cover. As tempting as it is to get around everyone, it’s much better to maintain a steady pace as covering 26.2 miles is enough! At London they paint a series of 3 blue lines on the road which show the exact 26.2 mile route. 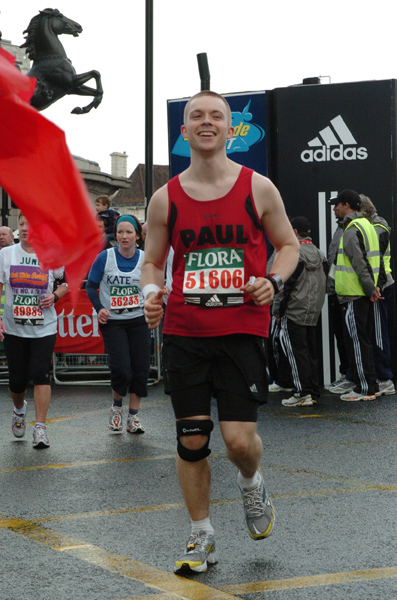 My biggest London Marathon regret was a year I tried to go for a fast time, realised early on that it wasn’t going to happen and then spent the rest of the race with my head down wondering why it had all gone wrong. The atmosphere at London is incredible, the crowds get larger and louder every year and there is barely any part of the course that isn’t lined with cheering supporters. Keep your head up, look around and take it all in. If you’re a runner with headphones, I’d advise trying to run without them and see how you get on or at least turn them down a bit or pause the music for periods. I’ll often run with my iPod in my pocket so I can bring it out if things get too painful, but try to be present in the moment taking in the full experience. Keep an eye out for people overhead on cranes with large video cameras, that’s the BBC recording their footage. Or possibly overly enthusiastic builders. Wave your arms, leap around, stick close to that crazy person in fancy dress – anything to try to get noticed. One of the spots you’ll always find them, aside from the start, is just before you turn right to run around the Cutty Sark. 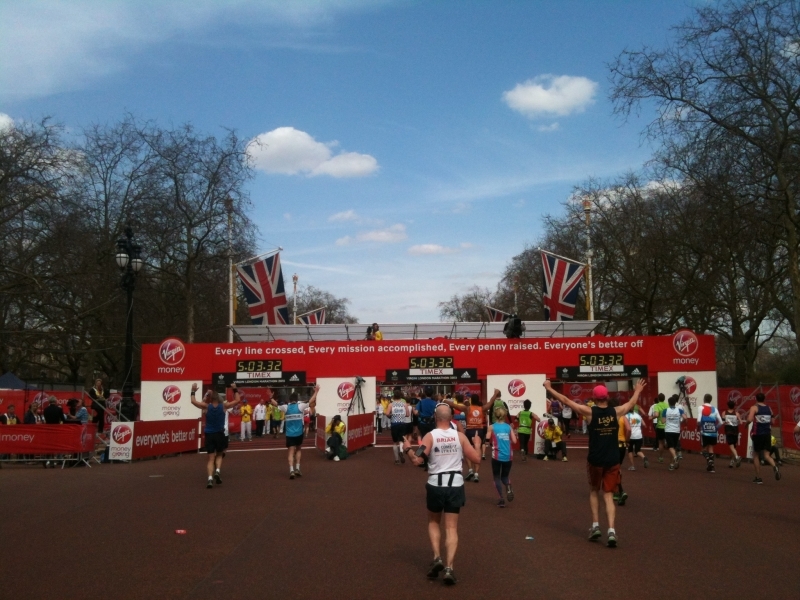 This is shortly after the 6 mile mark and just past the 10km section. You should still have plenty of energy for a jump at this point. 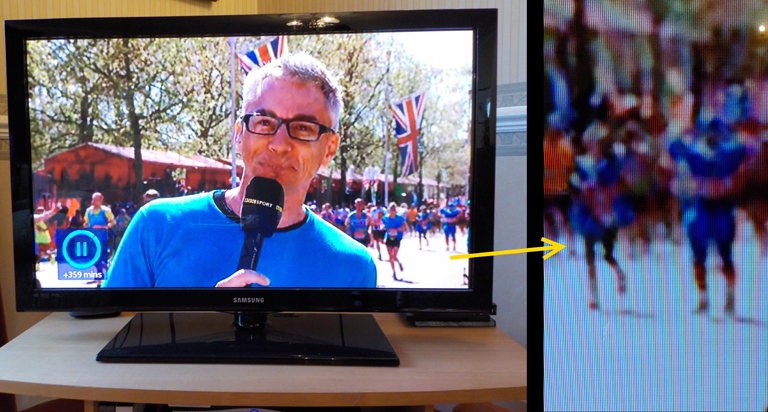 London Marathon 2014: TV ready? There we are, just appearing in the bottom right of the screen before the live broadcast ended! 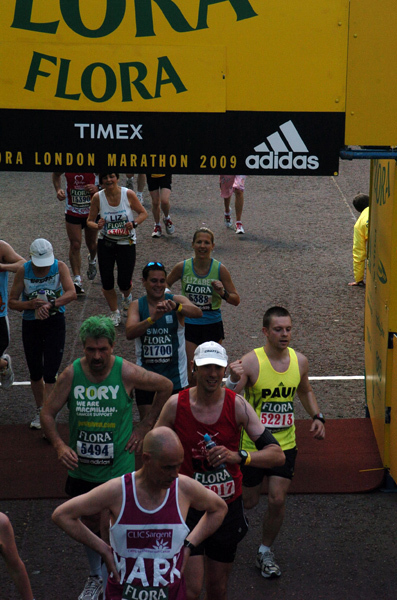 The London Marathon uses water and Lucozade in plastic bottles. These have the advantage over cups in that you can run with them for a while and also when you go to take a sip you don’t end up with it all over your face. The downside is the litter and hazards they can create. The volunteers do a fantastic job, but it’s impossible for them to clear bottles at the rate runners are throwing them down. Always try to throw your bottle away towards the edge of the road, many people will just drop them wherever they are and the road ends up full of them. Bottles which have had the lid closed shut will not crumple if you land on them, so watch those ankles, and bottles with the lids open will shoot like water cannons when someone else’s foot crushes them. Lucozade during the race is great, Lucozade blasted into your legs by the person next to you and now dripping down into your socks is not so fun. My best advice would be to grab your water / Lucozade bottle then just keep running until you clear the aid station. You want to get out of that area as soon as possible and not be trying to drink while you can’t look down at where you’re stepping. Once you’re clear, drink your drink, whether you walk (at the side) or keep running. If you’re running for a particular charity and wearing their charity vest, be sure to keep an eye out for their official cheer stations along the course. Hopefully they will have told you the spots where they’ll be. It’s worth planning ahead to make sure you’re on the right side of the road as you approach them, you don’t want to have to dart all the way across the road (see tip #3). Once they spot your vest they’ll erupt in the loudest cheers. 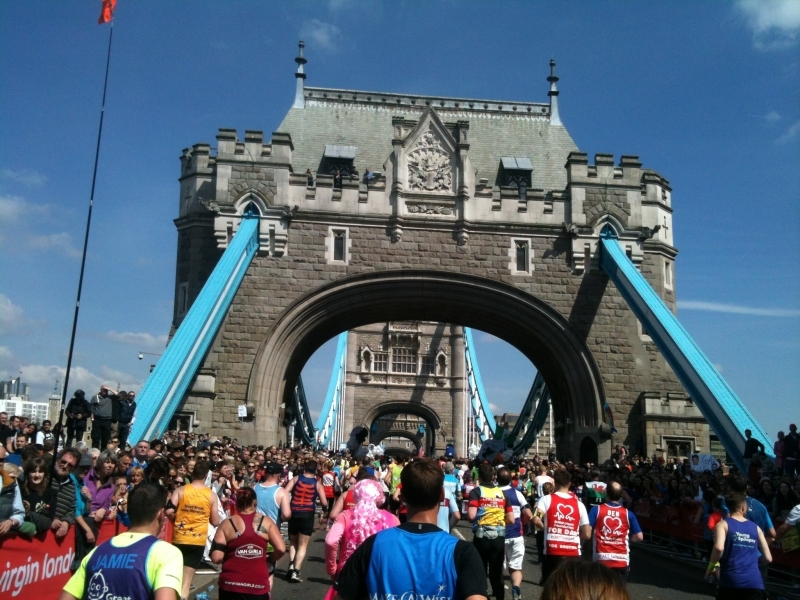 Just after 12 miles you’ll approach a right turn which then leads over the length of Tower Bridge. This is one of the most amazing experiences of the race. If you have headphones in at this point take them out. No, seriously. The thousands of runner’s feet hitting the bridge sounds like a huge drum roll and it means the crowd has to be even louder to be heard over it. It’s an explosion of sound and crowd support from both sides, charity supporters in particular are going wild. It’s also a spectacular view crossing Tower Bridge and looking up at the towers and across at the Tower of London. For a few minutes you’ll even forget to breathe. There are a few dark tunnels on the course and these are a rare spot where there won’t be supporters around. Some people use these to take a much needed walking break, a lot of the time to keep up momentum runners will sing the Oggy Oggy Oggy chant which echos through the length of the tunnel. If you get there and no-one is chanting, then start your own one off with “Oggy Oggy Oggy!”, you’ll feel great when everyone shouts back “Oi Oi Oi!”. In recent years they’ve also started putting toilets and men’s urinals inside the tunnels, although as it’s dark these always look pitch black to me. Maybe a good time to stop, perhaps not. Sometimes the advantage of no toilet queue trumps the downside of no vision. 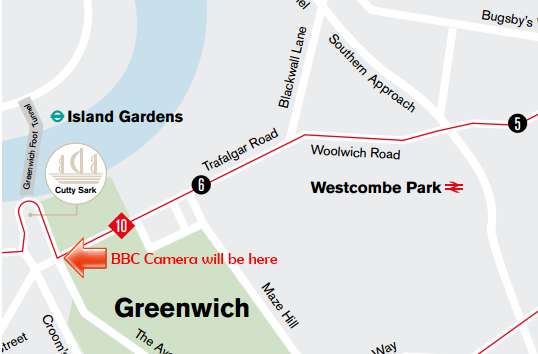 As a side note while talking about traditions in the London Marathon, just before the 3 mile marker the blue & green start runners will meet the red start runners on the other side of the road before everyone merges shortly after that. Expect some jeering and booing from either side, all in good humour of course! 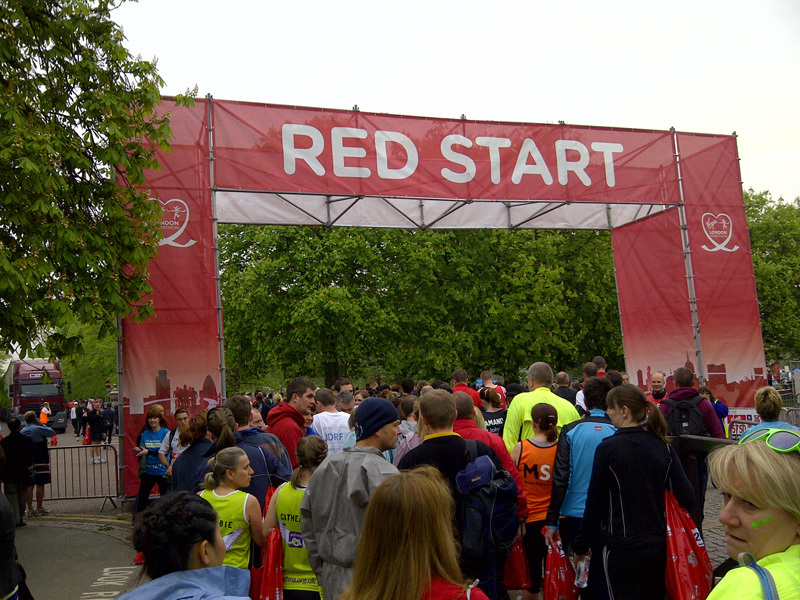 If it’s your first time running the London Marathon you may not realise that there are 3 separate finishing gates in a line at the end: left, middle, right. You’re free to run through whichever one you wish, and believe me I know that by this point logic and sense are usually emotions you’ve had to ditch 6 miles ago. However, if you can force your mind to make one final decision try to go for the gate that looks the least crowded or the one that less people are currently heading towards. It will make your finishing picture much better and with the added bonus that if you collapse you’re less likely to be trampled by everyone else. Or have another sweaty runner collapse on top of you. There is, of course, plenty of medical staff to ensure this doesn’t happen. It’s also worth a quick look over your shoulder to make sure you aren’t going to regret who you finished with. There’s nothing worse than your proudest moment and pinnacle of your athletic prowess being captured in time just as you get pipped to the finish by a guy in a rhino costume. 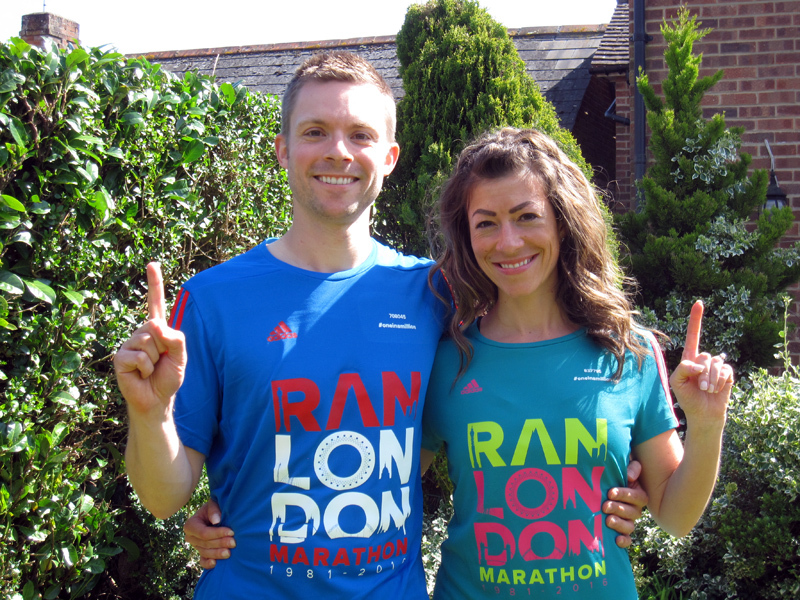 One final note, this year the London Marathon are encouraging everyone to cross the line with their finger up to signify being 1 finisher of a million, as the millionth runner will cross the line during the race. Let us know if these tips helped or if you have own to add. Although the form requires it, your e-mail address won’t be displayed in the comment. If you’d still prefer not to include it just make one up! 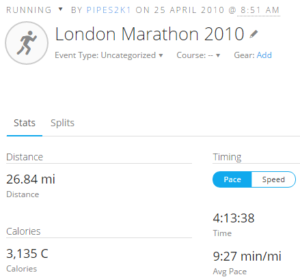 Posted in Articles and tagged advice, articles, london marathon, tips, top 10. Some great advice – especially through the water stations and zig zagging. But you’ve made me nervous now! Thanks Debbie! No need to be nervous other than with excitement, you’re going to absolutely love the day! Almost makes me feel it is time for a comeback! On second thoughts, no….